Ken M. King became President and Chief Executive Officer of the Calgary Roughnecks on June 14, 2011, with the Calgary Flames purchase of the National Lacrosse League Club. Since the summer of 2001, King has been the President and CEO of the NHL franchise Calgary Flames. King is a strong believer in contributing to the community and he knows incredible achievements can be accomplished when aspiration and determination mix with a visionary approach, meaningful intentions, responsible actions and, above all, consideration for others. His current community involvement spans numerous organizations, including chairman, TELUS Community Board, past co-chair of REACH (a $300 million medical fundraising initiative), the Calgary Committee to End Homelessness, the Calgary Sport Tourism Authority, the Calgary Exhibition & Stampede, Borden Ladner Gervais CIAU Athlete of the Year Awards Committee and the Rotary Club of Calgary. Previous support and commitment involved the Calgary Prostate Cancer Centre, Calgary Philharmonic Society, No Ka Oi Ranch Foundation and past-chairman of the Calgary Chamber of Commerce. In 2005, King received an Alberta Centennial Medal for outstanding contributions to the province of Alberta. Other awards include the Queen’s Golden Jubilee Medal for community service and the commemorative medal for the 125th Anniversary of the Confederation of Canada. In 1991, he was honoured as B’Nai Brith Man of the Year. Born and raised in Hanley, Saskatchewan, King launched a 30-year career in the newspaper business that included senior executive positions in Canada’s leading newspapers including President and Publisher of the Calgary Sun and Calgary Herald. During his newspaper career in Calgary, King was acknowledged for his innovative marketing, establishment of healthy corporate relationships, spirited community leadership and appreciable growth for the newspapers. King is an avid but mediocre golfer and like many other Albertans, shares a passion for horses. Most often he stays in the saddle. But not always. He and his wife, Marilyn, have two daughters and they are proud grandparents to Amanda’s twin boys and Jocelin’s baby boy. King also serves as an Alternate Governor of the NHL and President & Chief Executive Officer of the Western Hockey League’s Calgary Hitmen. 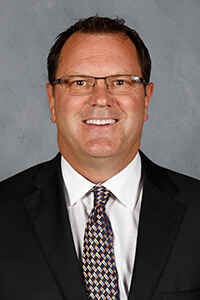 John Bean joined Calgary Sports and Entertainment Corporation (CSEC) in January 2010 in the role of Senior Vice President, Finance and Administration and CFO. Bean was named the Chief Operating Officer of CSEC in September 2013. In his role as COO, Bean is responsible for all aspects of operations for all four teams owned by CSEC including the Calgary Flames of the NHL, the Calgary Stampeders of the CFL, the Calgary Roughnecks of the NLL and the Calgary Hitmen of the WHL. In the summer of 2013, Bean lead the restoration and recovery of the Scotiabank Saddledome which was significantly impacted by the floods of 2013. In less than 70 days the entire event level of the Saddledome was stripped down to the concrete and rebuilt in time for the 2013/2014 NHL hockey season. 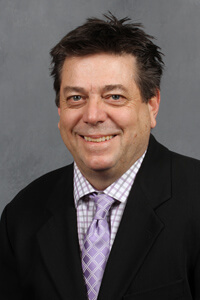 Mr. Bean is the National Lacrosse League Governor for the Calgary Roughnecks, Chairman of the NLL Audit and Finance Committee, a member of the CFL Audit and Finance Committee and the Treasurer for the Calgary Flames Foundation for Life. Prior to joining CSEC, Bean, a Chartered Accountant, held a variety of senior executive roles in the oil and gas services industry including Vice President, Finance with CCS Corporation Ltd. and Chief Financial Officer with Hazco Environmental Services Ltd.
Bean was born and raised in Saskatoon and attended the University of Saskatchewan. He and his wife Rhonda moved to Calgary in 1988 where they have raised two children. Bean enjoys golfing and spending time with his family. Mike Moore returns to the Calgary Roughnecks as the Vice President and Alternate Governor of the team. Moore was the Director of Business Operations with the Roughnecks for the initial two years of operations when they were acquired by the Calgary Sports and Entertainment Corporation in 2011. 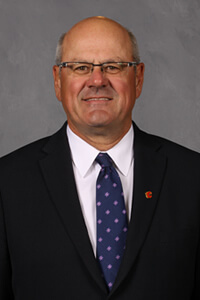 Moore has spent after 21 seasons in the Western Hockey League, 11 with the Calgary Hitmen. 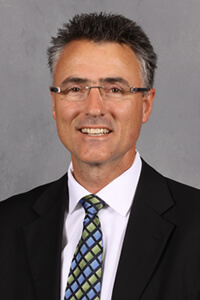 His decade of service with the Calgary Sport and Entertainment Corporation began with a one-year term as Assistant General Manager of the Hitmen in 1997-98. After leaving to take on the role of General Manager of the Kamloops Blazers for six seasons, the Medicine Hat Tigers for one season and Director of Athletics at the Edge School for three years, Moore returned to the Hitmen in 2008-09 season as Director of Business Operations. In 2012, he also added the title of Assistant General Manager of the Hitmen. Moore became the General Manager and Vice President of Business Operations in 2013, and was then promoted to Vice President and Alternate Governor in June 2017. During his Hitmen tenure, Moore has received a pair of WHL recognitions: the Marketing/Public Relations Award in 2010-11 and an Eastern Conference nomination for the Lloyd Saunders Memorial trophy as WHL Executive of the Year in 2013-14. Mike Board was named general manager of the Calgary Roughnecks in 2011. In his first season with the club he guided the team to a league best 12-4 record. He played lacrosse in Brampton and Peterborough, finishing his competitive playing career in Junior A lacrosse with the Brampton Excelsiors before attending Ryerson University from 1979 to 1982 majoring in Journalism. Since moving to Calgary, he has been active in lacrosse in various capacities as a coach and manager including an assistant coach role with Team Alberta (Bantam) at the 2006 Nationals. He originally joined the Flames organization in 2002 in the capacity of content manager for the Flames internet properties.